Book a Super-Couponing Workshop - Changing the way you shop... forever! Learn to cut your grocery bill in half in as little as 30 minutes each week! 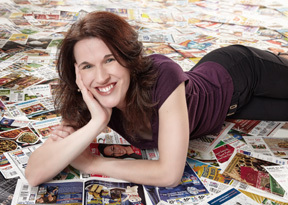 Want to bring a Super-Couponing© Live Workshop to your area? Looking for promotional photos, text or program descriptions for Jill Cataldo's Super-Couponing© workshops? Click for an online Media Kit! 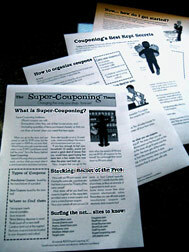 Super-Couponing© and Super-Couponing© 2: Saving on Everything! are fast-paced, high-energy, interactive workshops! Each features a 70-minute PowerPoint presentation with audience participation. Live Super-Couponing workshops also include a minimum of one half-hour question-and-answer session after the conclusion of each presentation. Participants in the Super-Couponing workshops also receive free "after care" in which they can ask questions and receive answers from Jill via Jill's blog, jillcataldo.com, further increasing the value of this program. 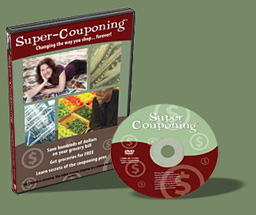 If you would like to bring Super-Couponing© to your organization, please email bookings@supercouponing.com for a quote. Super-Couponing is based in the northwest suburbs of Chicago. Note: Patrons are not allowed to use cameras and/or audiovisual recording devices to record any portion of the program. A representative from your organization may photograph the presenter and portions of the presentation for publicity purposes. Super-Couponing© classes are all taught personally by Jill Cataldo. This workshop is currently not licensed to other instructors. If you have attended or booked a "Super-Couponing©" class that was not taught by Jill Cataldo, the instructor was unauthorized to utilize the Super-Couponing© name, copyrighted information, handouts, and teaching materials in violation of federal copyright laws. Please contact Jill at jill@supercouponing.com with additional information about your experience. Is your organization interested in holding a Super-Couponing Video Workshop? Host a video class for your group, and you'll enjoy all of the same secrets, tips and techniques taught in Jill Cataldo's live Super-Couponing classes! This 70-minute video was shot before a live audience and contains extra footage specially filmed for the DVD release. With this package, you'll also receive a copy of the 4-page Super-Couponing handout that participants receive in Jill's live class. You may print and make copies of this supplemental material for your attendees. Note that if you have purchased the Super-Couponing home video, it does not contain a license for group exhibition. It is licensed for home use only. You will need to purchase this package, which is intended for group exhibitions and contains the proper one-time license for a group presentation. The license covers up to 200 viewers at a single event. If you have previously purchased a group exibition package and would now like to hold another event but do not need another DVD/handout set, please contact us for a new license for your subsequent event. Tax Exempt? If you are purchasing the package for a tax-exempt organization, please contact us for ordering instructions. Bonus Q&A Session: Schedule permitting, Jill may be available for a half-hour video question-and-answer session at the conclusion of your video workshop via Skype.com audio/video chat, which can be broadcast on a video screen so that swap participants can ask questions and receive live answers. Please contact bookings@supercouponing.com for availability, pricing and setup information if you are interested in adding this session to your workshop.